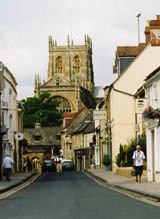 Sherborne is, without doubt, one of the most beautiful towns in England. With its abundance of medieval buildings, superb Abbey, world famous Schools, picturesque Almshouse and two Castles, Sherborne has much to offer visitors. Ideally located on the Dorset and Somerset border it has excellent transport links enabling the town to flourish. We are delighted to provide a new facility to support local businesses and the local economy. The Jobs section allows businesses to advertise employment opportunities and for those looking for work to advertise their requirements. We hope that this service will help our local economy to grow.